Edmonton university condemns racist posters placed at a dozen sites, as campus organizers plan a pro-diversity event in response. Twelve identical posters were found on the campus Monday, including one at the university’s main library. The University of Alberta’s Protective Services are investigating the incident, said Alison Turner, manager, strategic communications. “We’re obviously all very disappointed by the xenophobic posters,” Fahim Rahman, president of the students’ union, wrote in a statement condemning their placement. A message posted on immigrationwatchcanada.org stated that the organization condemned the poster, and permission was not sought from Immigration Watch Canada to circulate such a poster. 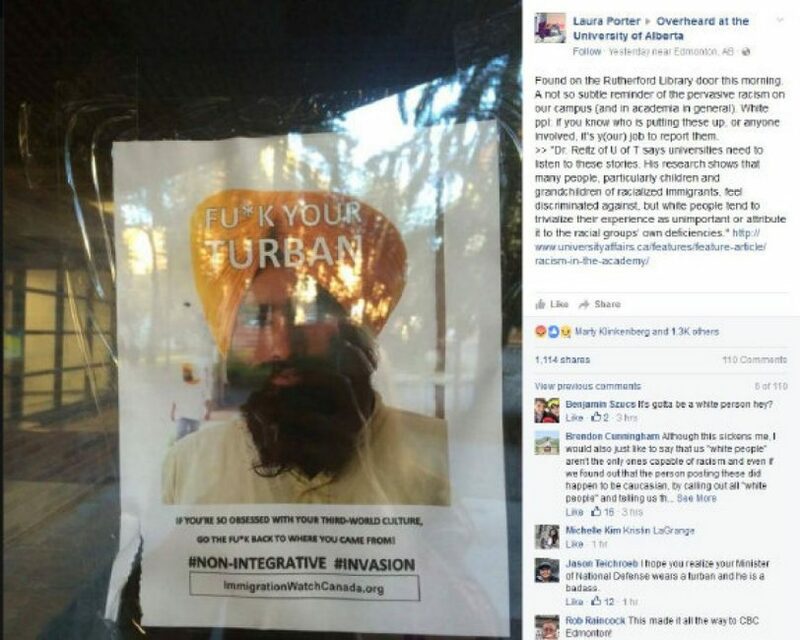 Arundeep Singh Sandhu, a former U of A student, along with the University of Alberta Students’ Union and the Sikh Students’ Association, plan to organize an event next Tuesday on campus in response to these posters. At the event, students of other faiths, cultures and backgrounds can have turbans tied, and can pick up books about Sikhism. Education is one of the ways to fight such incidents, he said. “It is a chance to connect one-on-one … ask questions that you didn’t feel comfortable asking,” he said. Such incidents have happened before, Sandhu said. But the openness, acceptance and diversity of Canadians has always countered them, he added. University president David Turpin said the university is open to all people and takes pride in the strength of its diverse community. The World Sikh Organization of Canada stated in a response on its website that Sikhs are an integral part of the Canadian fabric. “Many turbaned Sikhs serve Canada in the federal cabinet, armed forces and many other capacities,” it said. Defence Minister Harjit Sajjan, in a message posted on social media, said he is proud to be Canadian, proud of his service to Canada, and proud of his turban. U of A doesn’t have any information about religious and ethnic composition on campus, said Alix Kemp, external communications and media advisor for the U of A’s students’ union. According to the 2011 census, there are some 455,000 Sikhs in Canada. The first came to Canada more than a century ago. In May, Trudeau issued a formal apology on behalf of the Government of Canada for its role in the Komagata Maru incident, in which a ship carrying 376 Indian passengers was turned away from Vancouver in 1914 and, after two months in limbo, returned to India where at least 19 people were killed by British soldiers and others imprisoned.